We have some good news for the LG G2 users. The Android 4.4 KitKat update for the Korean unit has been finalized and is already seeding to the the smartphone in its home market. If you live in Korea and you own an LG G2, the new firmware is already waiting for you to get it. You just need to use the official LG Update Tool on your computer instead of the over-the-air service on your phone. In the beginning of November we also saw a leaked roadmap of the French carrier SFR. 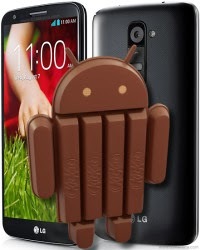 It showed us the SFR users with LG G2 will be getting Android KitKat in November or December this year. There is still nothing official though, but December is upon us, so we guess the SFR G2 owners will get to experience the latest Android build soon enough. Finally, the guys over Mobile Syrup have received some interesting info straight from LG Canada. According to their information, the Canadian G2 smartphones will be getting Android 4.4 KitKat in late Q1, 2014 (that's late March). It seems the LG G2 around the world will be skipping Android 4.3 Jelly Bean and that's not bad given that it has helped it get Android 4.4 KitKat so soon after its release.